Super Seal removes the smear layer, seals tubules, and desensitizes in a single step. 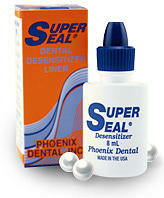 Super Seal is Phoenix Dental’s leading product— a dental desensitizer and liner that is designed to work immediately and eliminate postoperative sensitivity. In 1 step, Super Seal’s unique formula removes the smear layer, seals tubules, and desensitizes patients with no pumice cleaning or rinsing required. I use Super seal on patients with abfractions, as well as slight gingival recession. Patients like it because it works! no more sensitivity!